Over the past couple of days you may have noticed that I increasingly tweet in Dutch. The reason for this is that I’m actively engaging in the political debate currently unfolding in The Netherlands. Some of the non-Dutch people in my network have shown an interest in understanding what’s at stake in Dutch elections coming up June 9th. Hence this post, in which I’ll try to explain as succinct as possible my view on the current situation, as well as what explaining some stuff around what party I’m supporting & why..
We can only elect parties in the so-called 2nd chamber. We do not elect the 1st chamber, which we choose indirectly only, when we vote for regional chambers (we have 13 regional chambers). All laws that pass 2nd chamber, need to pass 1st chamber too (2nd..which is truly strange if you think about it :D), by simple majority. Changes to the constitution is more complex, so I won’t go into that here. We do not vote for a president. We vote for parties, or at best persons on the list of parties. We do not have two parties, nor three. We have many different parties. As a result we have had coalition governments for ages. In normal situations two or three parties form a coalition government and the largest party will get to deliver the Prime Minister (Minister President). This usually is the political leader of the party. Until recently we had a 3 party government consisting of PvdA (Labour Party), CDA (Christian Democrats) and CU (Christian Union). Yes, we have two different Christian parties in government. The first (CDA) being more right wing, the second more left-wing. Both share the Christian background as in being pro-life, family values oriented. A couple of months the government collapsed over a discussion whether we should continue our efforts in Uruzgan. Over three years ago it was agreed that we would step out by the end of this year. CDA and CU were willing to reconsider. PvdA was not. And with some other political differences lurking on the background, this was the stick they needed to separate. So now we have elections. This may sound odd, but the Uruzgan position is not an issue in the current debate. With the financial crisis economic politics is what we are all talking about. As a consequence of saving some banks and other financial injections into our economy, our nation is heading towards a budget deficit of appr 6 % (on gross national product). In short: we need to cut budgets or increase government income to ensure that we are getting in line with the 3 % max we agreed upon in Europe (for comparison: Greece, UK and many other European countries are above 10 % deficit. NL is doing quite well). Our unemployment rate has increased too, yet is still way below the European average. Still, the shared opinion here is that we need to decrease it and that we need more people to enter the labor market in the future. This is because our population is getting older. If we want to continue our right on government paid pension at a certain age (65 currently) we need more people working to pay for that. The same is true for our health-care system because of the same demographic trend. As per Dutch tradition we always discuss financial measures in relation to income politics. Hence: to what extent do we ask less from people with low incomes, or protect them completely..
What is our role in European Union, what should it look like, are new countries welcome to the party? And what is our role in the International community in general (supporting developping countries etc). CDA and VVD do not want to change the tax-deductibility of the mortgage interest. Both want to increase our pension age from 65 to 67. To save money they want to cut into social security quite fiercely, with the VVD championing that. Both want to invest in more roads to make way on our digested automobile infrastructure. They do not want to change car-ownership taxation into car-usage taxation. Both VVD and CDA are doing a lot to support entrepreneurs and companies by lowering taxes for them. PvdA (labour, socialist party) does want to increase the pension age from 65 to 67 too, and they want to cut into tax-deductibility of mortgage interests quite fiercely. They also want to introduce a new top tax tier rate of 60 %. By doing so allowing little savings on social security and little changes in health-care support for low-income groups. GroenLinks and D66 both want reform of the complete system of supporting house-ownership and rents. In general they want reductions in tax deductibility of mortgage interest (flat percentage for all people). Both also want an increase in the pension age from 65 to 67, mostly a little faster than the above three parties. Furthermore both want to change the tax-system from a tax on labour, to a tax on consumption. GroenLinks is championing there. Both mainly do so be reducing taxes in the low tax-tiers. GroenLinks furthermore wants to increase the top tier rate of our tax system from 52 % to 60 % (only of 10 % highest incomes). D66 wants to decrease the time you are entitled to unemployment security to 1 year maximum (before you enter into social minimum security). Both GroenLinks and D66 want to implement a car-usage taxation and get rid of the car-ownership taxation, we currently have. The PVV does not want to increase the pension age, nor do they want to decrease tax-deductibility of mortgage interests. I’m not sure where they get their savings from entirely (I never consider them personally, because they are essentially a very xenophobic party, that is pushing topics such as the Islam should not be tolerated in our country), but it is clear it will be in the area of social security and by reducing governmental overhead (to an extent not likely feasible nor desirable imho). The PVV is a truly populist party. 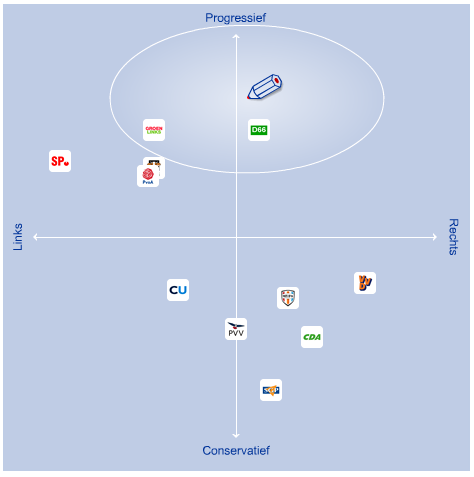 In a picture, this is what the landscape looks like (horizontal axis: Left-wing to Right-wing ; Vertical Axis: (top) Progressive to Conservative (bottom). The little red pencil shows where I’m at in that landscape.. The main threat in these elections, imho, is that both CDA and VVD, who are very like-minded in many ways, will form a coalition government with the PVV. They may do so, because the PVV supports some of the interests both CDA and VVD want to protect: mortgages of the already wealthy people. In order to get an agreement with the PVV they will likely come to terms on a smaller increase in the pension age (66, not 67 e.g.) and in order to finance this they will cut more severely on social security, health care and likely even more on our nation’s innovation and educational capabilities. Most of all: much of the financial pressure will be on the ones already struggling to get around. All basically with the interest to keep things as they are.. just doing some things more and other things less. But is that not what being conservative is all about? Fortunately, and I’m getting less and less objective here as you may notice, CDA is decreasing in the polls every week. This will make them a less interesting (and even willing) coalition candidate. PvdA, GroenLinks and D66 already made clear they do not want to do business with the PVV, thus paving the way for a progressive, purple coalition of VVD, D66 and PvdA and potentially GroenLinks. This may not sound a likely solution for non-Dutch readers, but is has been done before, albeit without GroenLinks at that point in time (early 90’s). This so called purple coalition, made some of the best reform and created the most new jobs in the political history. Moreover I believe a coalition like that can count on broad support in The Netherlands and asks for a collaboration across the entire political (=societal) spectrum. I’m a firm believer of collaboration, and having seen it two decades ago, convinced this is possible again. It will be an opportunity to truly reform some of the most expensive, counter-productive and unfair systems we have. And we will loose the “we control you, because we know what’s best for you”, so typical for Dutch conventional & conservative parties. (I can’t wait).. I choose D66, because of a sound financial plan for the future, in which we all pay to pave the way for our children AND in which the not so lucky people are supported by the more fortunate. Futhermore they invest heavily (2,5 billion) in our eductional & innovation capabilities & quality of both “systems” to improve the outcome of that for our children and our country in an increasingly competitive world. Also they make a serious effort to go from a labour tax to a consumption tax-system in which polutive actions/consumption is taxed more heavily than non-polutive actions/consumption. Prefer purple over red (which is a risk if you choose PvdA or GroenLinks) or conservative..
D66 is a party that is truly liberal, allowing all people the same freedoms, not just the fortunate white Dutch people. Moreover: D66 is not interested in interfering in the lives of citizens, nor telling them what they can or cannot do. D66 wants to create the conditions though, on which each person can himself create his life to the maximum of his capabilities, without harming the opportunities of others. And because they are people, who consider themselves lucky, they ensure that those not so fortunate, are supported and stimulated to leverage their capabilities and shape their lives as they desire, too. D66 is a party of people (that think and act) like me.. and it is those people I trust most with the difficult decisions they have to make, on my behalf. Are we “getting” our Customers and Jobs right? In 30/40 years you’ll live under sharia law ! so i wouldn’t worry about the pensions.. Your readers can find a truly excellent explanation of Dutch politics for foreigners at http://www.quirksmode.org/politics/ . The article series on Dutch political history you can find there is not quite complete, because the elections came a year early, but there is a lot of information there, and there is a blog with day-by-day updates on the election campaigns.